The game sets the context of learning and gives that learning some meaning. Play is the true environment within PE and results in improved and sustained motivation. Technique cannot be separated from decision making if we want to help create confident and competent movers within sport. This process started over 6 years ago and whilst buy in for rugby and football was immediate and has been slowly refined, cricket was resistant to any change. All of us had been taught and have taught cricket in the traditional way and found it difficult to conceptualise a very technical game taught through mainly through games. We were addicted to ‘Grip, Stance, Backlift’ and giving up seemed impossible. This year though we decided to go cold turkey and embrace a Game Sense approach to teaching cricket to 150 boys in Year 7. It has been one of the most challenging things I have done to date within my teaching career, but possibly one of the most rewarding. Before implementing our Game Sense cricket curriculum we had a departmental ‘pre-mortem‘ meeting. This is where we came up with as many ideas of why this approach might fail. We discussed many potential problems but the three biggest for us were time constraints (lesson and unit), meaning for the children and our own expectations of what a good cricket lesson looks like. In our planning we overcame the first problem by asking our ground staff to paint out 20 rectangle pitches of 32m by 40m and deciding to teach for an extended period of time (15 lessons). We over came the second problem by ending the unit by having a tournament which every pupil participated and contributed to in some level (A Game Sense/Sport Education Hybrid?). The third would only be solved by patience and support. Patience with the children, with each other and with the process. We were all in this together and therefore would be supportive of each others endeavours even if they resulted in poor outcomes. In our first lesson we taught the pupils how to set up quickly for a game of 8 player Kanga Cricket ensuring they knew the rules and could officiate the game themselves. Our focus was ensuring they could handle any disputes and that they were supportive of each other when making mistakes. Whilst we taught technique and game context through many varied games we always came back to Kanga Cricket as a way of judging performance and learning. 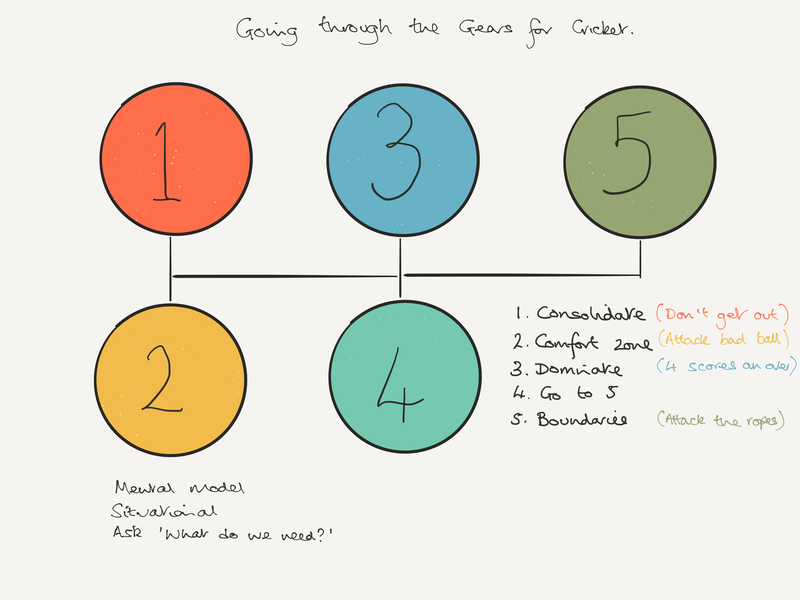 I decided to focus on batting and used a mental representation of ‘going through the gears’ to guide the purpose to my teaching, the design of games and the formulation of questions. An answer to the problems experienced in Game 1. They are then given time to implement their solution. Difficulties highlighted in Game 1. They are then given a deliberate practice that can help them over come those difficulties before going back to Game 1. The problems in Game 1 have been solved therefore progress to Game 2. This is a more complex game but still focused on the learning intention. Pupils could end up playing different versions of this more complex game, depending on their current understanding and performance. 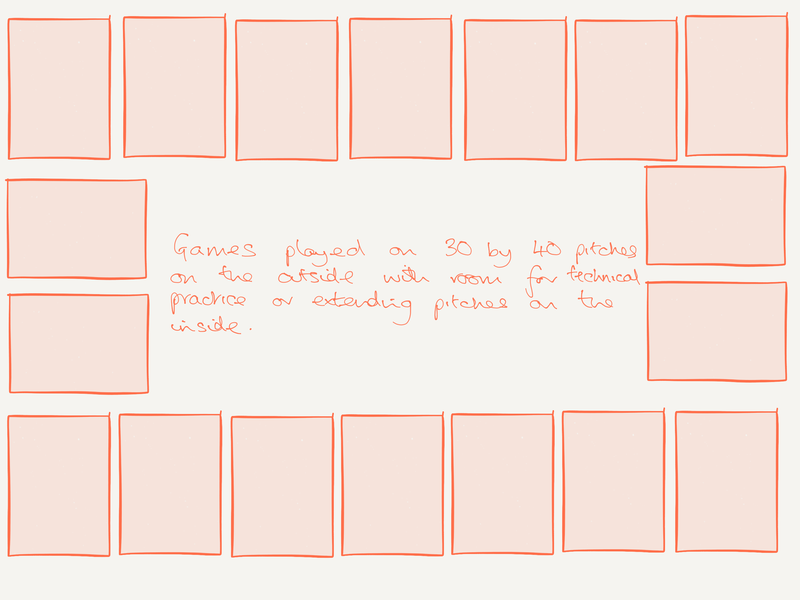 This can end up with a very chaotic lesson with children moving between games, from game to practice and back again and from more less complex games to more complex games back into Kanga cricket to see if what they have learnt has been trasnferred. All the time this is driven by their reflections and answers to the questions we posed. It requires a huge amount of judgement by the teacher and I have realised that I am a very long way off from this, especially in cricket as my previous teaching me has protected me from this level of decision making. Believe in the Leave is an example of a lesson where the focus of batting was on the principle ‘don’t get out’ by staying in Gear 1. Essentially they needed to play with a straight bat or be confident enough to know where their stumps are in relation to the pitch of the ball. Through play, questioning to prompt reflection on play, practice and manipulation of the rules of the game (through Gene Schembri’s CHANGE IT formula) pupils could be consistently challenged through increasing or decreasing the complexity of the activity they were involved in depending on their performance, reflections and my observation. Game Sense is certainly not a ‘roll out the ball’ way of teaching sport. It also doesn’t reposition the game as the teacher. The teacher is still the teacher and it requires us to be deliberate about the purpose of the games being designed and intentional with the questions being asked. It has highlighted that my questioning is still very weak, as I often found myself playing ‘guess what the teacher is thinking’ rather than guiding their attention and reflections to the learning intentions of the game. 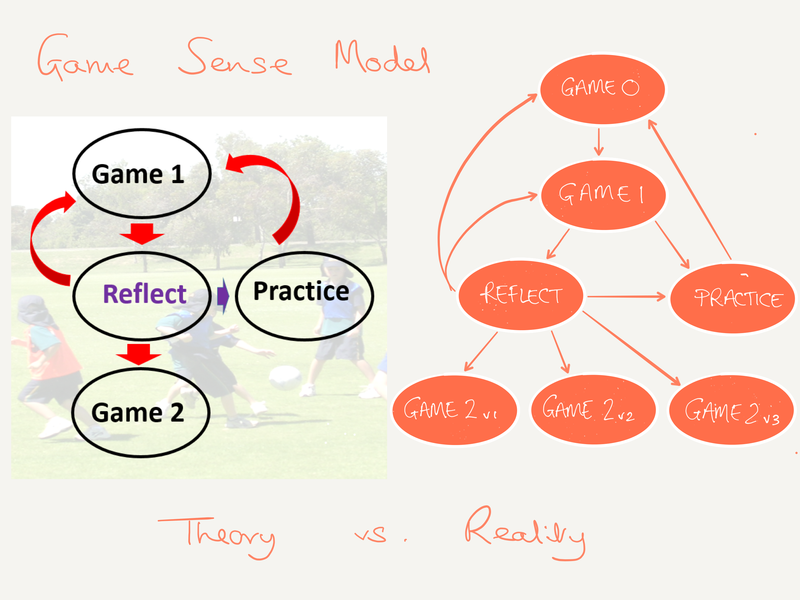 Game Sense also still has a place for technical practice away from the game, but that technical practice now has context and meaning for the pupil. I have found teaching this way far harder than my traditional technical way of teaching cricket. It is far messier, it has pushed my subject knowledge and I have made lots of errors with the games I have designed. However I have learned a lot going through the process and will take those lessons into my teaching next year. Developing any new teaching method takes practice, reflection time and patience over years not just a lesson or unit. In the end though stepping back and watching 150 boys set up, play and officiate a game of Kanga cricket themselves is genuinely one of the best moments of my teaching career to date. Game Sense does not solve the issue children asking questions about playing a game in the lesson. They still remain. However they had changed from ‘will we play a game today’ to ‘what game will we be playing today’ and that’s a change I can live with. Well done for trying this – this approach looks a bit like the programme I wish I had been bold enough to try with my Club U9s this summer! Can I ask – beyond the (well deserved) satisfaction of watching 150 boys playing cricket, what were the outcomes of the programme? Did you see players with improved understanding of the game? There is a great line (paraphrased below) from a recent edition of Stuart Armstrong’s Talent Equation podcast – “our team might not be as technically proficient as the opposition, but they do know how to play the game” – skill grows from game awareness. Thanks for the comment and share Andrew. Most of the outcomes we saw are mainly subjective and anecdotal. All boys played in a House Competition (5 houses with each house putting forward an A, B and C team). The ‘standard’ of cricket was higher than both the Year 8 and 9 House competitions. Probably because they spent more time playing cricket in Year 7 than their peers have in Year 9 in total. Batting was an area we felt disappointed with, as progress wasn’t as good. Mainly because their was less repetition than usual (but much more repetition without repetition) and we only focused on ‘hands and head’ technically. We are hoping that although progress is less, that retention might be more. Trying to remain patient as this will be a 3 year programme of cricket within our curriculum. However one objective measure was after school practice (which is voluntary for all our extra-curricular activities). We usually average around 24 in Year 7 cricket. This year our average turn out was 39 with over 70 boys turning up at least 3 times and 52 boys getting a chance to represent the school team in hardball cricket. This key will be wether we can sustain those numbers through Year 8 and 9. To me, this all sounds very positive. 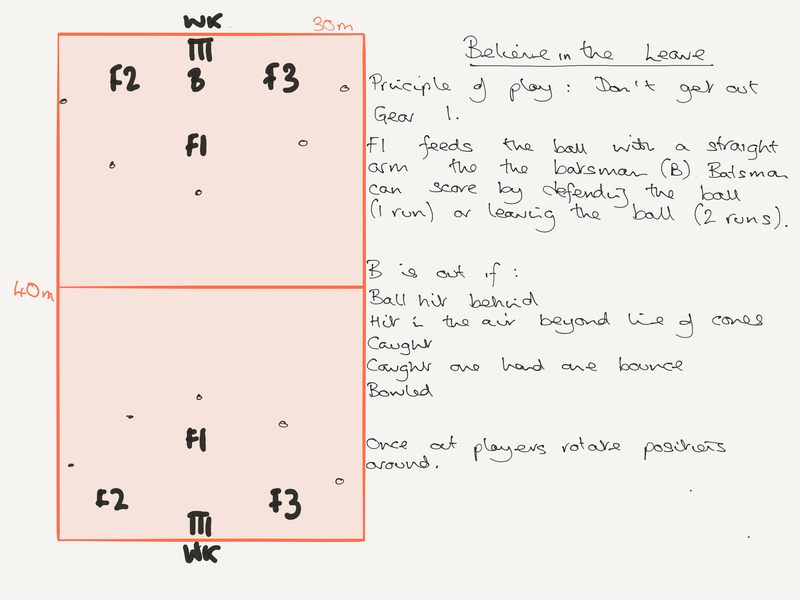 And it fits with my ambitions for the U9s – to help them to be ready to play, so when they get called up to to (hardball) U11s they already know what they are meant to be doing (even if they struggle, at first, to put it into practice). “Most of the outcomes we saw are mainly subjective and anecdotal.” – this is probably inevitable, although player retention (as opposed to retention of learning and/or skill) is probably a good proxy for a positive outcome. I have always believed that if the numbers attending practice stay constant, or even increase, then I am probably doing something right! I’m not convinced that truly scientific studies of coaching interventions ever could be performed – “gold standard” would require random allocation of players to intervention and control groups, coaches to apply interventions with no bias (impossible, surely – “I know this is right because that is how I have always worked/how I was coached” or “’coaching ‘science’ says this must be better”), players to have no preconceptions about the interventions (“you learn cricket by practicing in the nets” or “why aren’t we doing drills?”). I had an exchange with a former academic on “evidence” in coaching – he told me that I was wrong when I said that I was not seeing many “scientific” evaluations of coaching interventions; then went on to explain that the type of study I was referring to was difficult to carry out, rarely reported, and perhaps better conducted in a coaching environment, rather than an academic. Given the coaches’ preconceptions on interventions, it could be difficult, ethically, to allocate one study group to an “inferior” intervention, even harder just to leave them to play (although I accept that there is a strong argument in favour of this approach for beginners). Now this just might be the model for future coaching programmes. Strongly in the “game sense” mould, with the players taking a lot of responsibility for their own learning. Not that the coach gets to sit down and do nothing for an hour – there will be a lot of observation and analysis, followed by questioning and appropriate feedback; there will be an increased need for imaginative game design, with appropriate progressions planned. But the potential upside, of developing thinking cricketers, must surely be worth the effort. Game sense is awesome. Thanks for the info. Hi Shahzeb. Glad you found it of use. 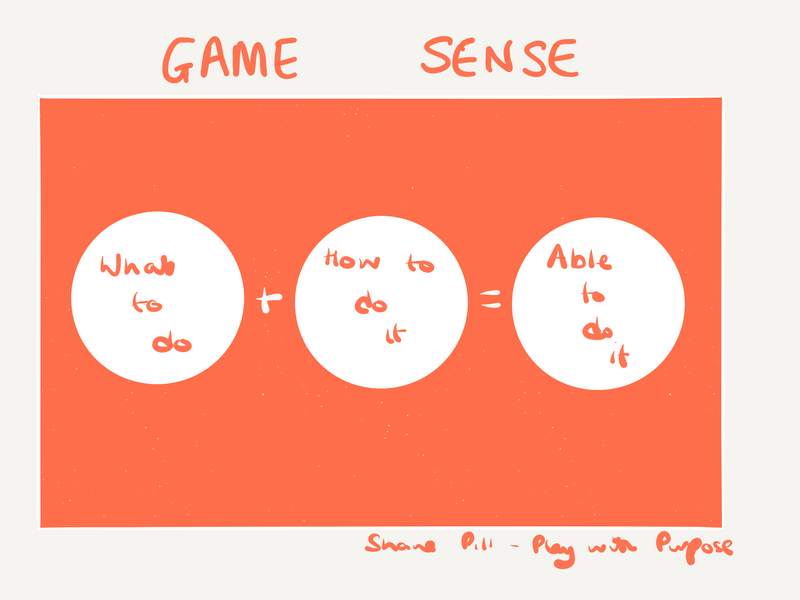 Are you using a Game Sense approach for your teaching/coaching? If so how have you found it? Anything you have learnt from using it?